Monitoring your health from your living room: Ochsner, a Louisiana-based nonprofit health-care provider, is banking on its belief that easy-to-use technology can help people control their chronic illnesses without costly hospital stays or emergency room visits. NEW ORLEANS – There were termites in the garage and a $2,100 bill to get rid of them. The mechanic had called to say he didn’t know when the car would be fixed. So after a summer day full of aggravations, 73-year-old Ann Ware wasn’t surprised to see the result when she sat down on her sofa, wrapped a blood pressure cuff around her arm and pressed a button on her iPhone screen to trigger the cuff to take a reading. At 8:30 a.m. the next day, she got a call from someone worried about the result. It was “Miss Megan” McKenzie, a clinical pharmacist at Ochsner Medical Center. Ware told McKenzie about her stress but said she didn’t have any alarming symptoms. 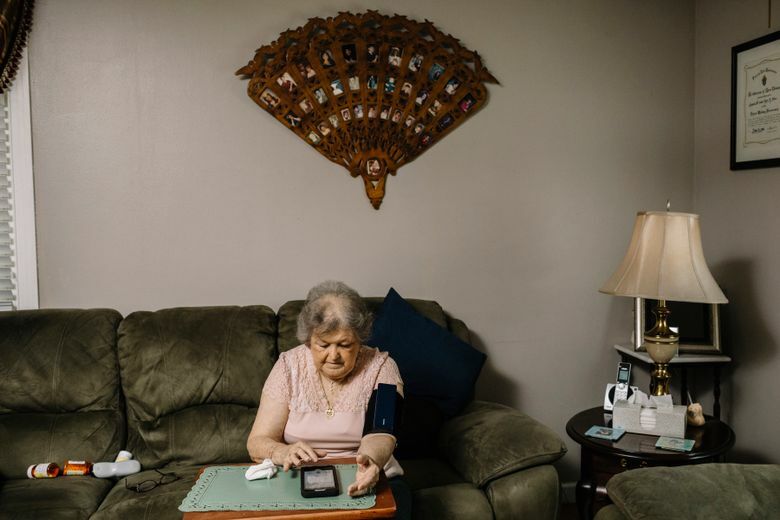 For the first time in years, Ware’s blood pressure is near her goal, managed remotely in the months between appointments by a care team guided by the measurements she takes once or twice a week from the comfort of her living room. Her iPhone, which connects to the blood pressure cuff by wireless Bluetooth, automatically sends the data to her medical record and a care team of pharmacists and health coaches. The approach could benefit more than 100 million Americans who are at increased risk of heart attacks and strokes because of high blood pressure. It could herald the disruption of medicine by gadgets that enable patients to collect, monitor and share their own data. Yet the real barrier to widespread use of at-home blood pressure monitoring and other similar innovations for chronic diseases like diabetes and heart failure is not as much technological as human. Ware’s Bluetooth cuff is a modernized version of a century-old technology, and her iPhone is a hand-me-down from her grandson. It’s the support system around the cuff that is hard to replicate – Ware’s “Miss Megan,” the digital pipeline to make sure her data doesn’t sit unread on some server or overwhelm doctors, and the commitment by Ochsner to build consumer-friendly tech centers to help patients set up their gadgets. Other programs around the country have tried to use technology to connect patients and their health-care providers, but they are not yet widespread. That’s largely because they represent major shifts for health-care systems that are still largely paid for patching people up, not preventing sickness. The current system excels at delivering acute care: Patients show up in doctor’s offices with illness or injuries, and doctors are paid for services rendered. But as health-care spending has soared, driven by costly and often preventable chronic diseases, there’s a growing realization that the model is a poor fit for lifelong conditions that are shaped by what happens between office visits – whether it’s remembering to take their pills each day or sticking to a diet. Ochsner, a nonprofit health-care delivery system in southeast Louisiana with 30 hospitals, is gambling that the health-care system is finally ready for change. Technology is pervasive in people’s lives, insurers and government health plans are gradually shifting to pay for the quality instead of the quantity of health care people receive, and consumers are demanding convenience. When Ochsner launched its digital hypertension program three years ago, the health system footed the bill for the blood pressure cuffs, the care team and the digital infrastructure. It was a risk. Research suggested the approach could achieve far better blood pressure management, but it wasn’t clear if in a real-world setting, patients would value the information, doctors would be open to using it and people would end up healthier. Ochsner’s early evidence showed that within three months, more than two-thirds of those receiving the digital intervention had their blood pressure in control, compared with 31 percent in a group that got traditional care. Whether that will translate into saving lives, preventing strokes or saving money remains to be rigorously proven, but the health system has 2,500 patients in its digital hypertension program and has expanded its platform to other areas, including pregnancy and diabetes. Before Ware began using the wireless cuff and app, her blood pressure fluctuated out of control. Once, it spiked so high that the school nurse where she worked as a special-education teacher forbade her from climbing the stairs to the classroom and drove Ware straight to the doctor. For years, Ware took medications and used a cuff she bought at Kmart to monitor her blood pressure at home. She recorded her numbers in a notebook, but the data didn’t reach her doctor in real time – and, often, not at all. Ware’s combination of 11 pills a day has been adjusted over time by McKenzie to a regimen that brings her blood pressure close to her goal – progress that she can mark by scrolling through her blood pressure readings. In April 2015, her blood pressure was 178/83; now on a good day it may get down to 120/60. What’s happening at Ochsner underscores an irony of the innovations that may ultimately change how health care is delivered: In many ways, it’s rather low-tech. The ability to collect data isn’t exactly new. But technology can allow the health-care system to overcome bottlenecks in routine care, most clearly on the medical side, but also in nudging patients to change behaviors. Previously, patients like Ware spent months when their blood pressure was out of sight, out of mind to their medical team. If a certain combination of pills wasn’t working, the doctor probably wouldn’t find out until the next visit. Patients who stopped taking a medicine because it was making them too drowsy might not tell their doctor. The flow of data provides a backstop – allowing the care team to reach out and figure out, if a person drops out of control, whether a patient needs a new drug, an exercise plan, or a reminder to cut back on salt or to take her pills. Ochsner has begun to extend the platform to other conditions, including helping people with diabetes keep their blood sugar in check and helping pregnant women skip appointments through remote monitoring. Rajiv Gala, an obstetrician and gynecologist at Ochsner, takes part in a program that provides pregnant women a wireless scale, a blood pressure cuff and three urine tests that they can report through an app. The program allows women to skip up to three appointments. On a recent visit, Gala pulled up the weight readings of his patient, Shayna Morvant, 31, a busy lawyer midway through her second pregnancy, showing her that her pregnancy was on track. Morvant said she feels as if she’s more closely monitored and is happy she doesn’t need to wrangle her schedule to leave work or arrange child care for her son. “In a way, it does show medicine is catching up to where we are,” Morvant said. Ochsner is beginning to win over insurers. Blue Cross and Blue Shield of Louisiana recently agreed to pay for the blood pressure cuff and remote monitoring and care. But the spread of such ideas more uniformly is grudgingly slow and often varies, clinician by clinician. “All these other strategies have uniformly been shown to be better than the old model. But we can’t transcend the old model, and I continuously ask myself: Why is that?” said Eric Topol, a cardiologist at Scripps Research Institute who recommends his patients self-monitor their blood pressure. Topol chalks up the resistance to change to a “multifaceted excuse.” Physicians, he says, are reluctant to cede control to patients. The way physicians are typically paid further ossifies the system. He thinks patients will ultimately be the ones to demand change. Karen Margolis, executive director of research at HealthPartners Institute in Minnesota, published a clinical trial five years ago in the Journal of the American Medical Association showing that a remote monitoring program for blood pressure with a pharmacist team could control blood pressure. Margolis is conducting another, larger study and plans to use modeling simulations to project whether the better blood pressure control translates to fewer deaths. Because high blood pressure is a well-vetted risk factor for a slew of cardiovascular risks, it may seem only logical that the program would have that effect. But Krumholz, of Yale, tested telemonitoring of patients with heart failure, where sudden weight gain is a predictor of worsening health. That large clinical trial didn’t find a benefit to daily phone calls in which patients reported their weight and symptoms. “It generated a lot of data, and nobody knew what to do with it,” Krumholz said. Even as large medical organizations wrestle with how to implement technology into care, the convenience and value of integrating the data are already becoming clear to many patients. Houston and Barbara Thibodeaux moved to Kenner, Louisiana, to be close to their twin grandsons. When Houston’s blood pressure spiked dangerously high this spring, he started in the program and a pharmacist began checking in with the 74-year-old every so often to tweak his medications. Thibodeaux was gratified when he saw his numbers start to nudge down. So when a health coach encouraged him to start exercising, he and Barbara started taking walks around their neighborhood. His numbers continued to get better, and he joined a gym and began exercising five days a week.